The new ShadesScapes pavilion shade goes up over the stage area at Oasis. Oasis had just gotten a new pavilion above its outdoor deck when Irma lifted the shade structure right off its concrete footings and carried it about 150 feet away, dropping it in Coral Bay. The deck, where the original wood and metal-roofed pavilion had been, is a great place to enjoy St. John and Coral Bay, and maybe catch some music and some delicious offerings from owner Karen Granitz’s kitchen. 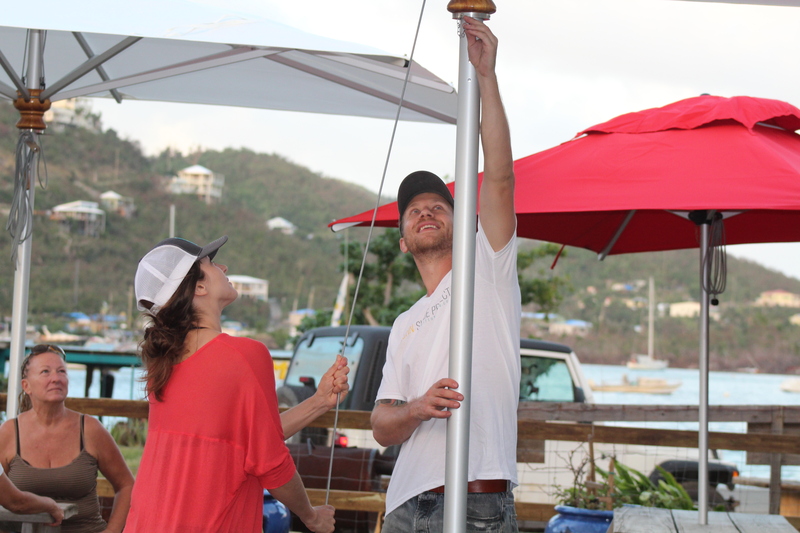 The restaurant’s choice location, popular bar, and delicious cuisine aside, its newly repaired deck was very open and exposed when the St. John Shade Project concrete crew arrived on Saturday to prepare the bases for two 11-foot, 6-inch, South African-designed white umbrellas. 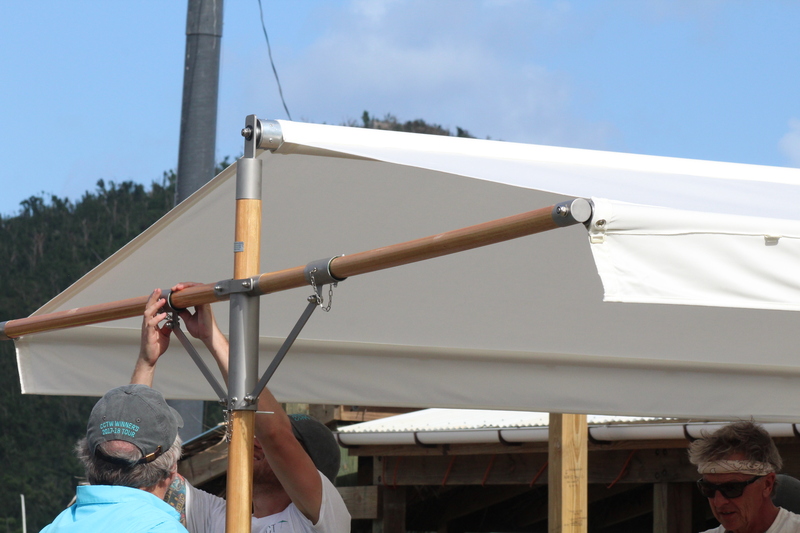 Two days later, the entire project team was back to install those and three other donated shades. To test out the amenities, the crew worked the bar, serving drinks to those who came to watch the installation and enjoy the shade. The owner of St. John Brewers, Cheech, dropped by for an unannounced visit while many enjoyed his fine ale. 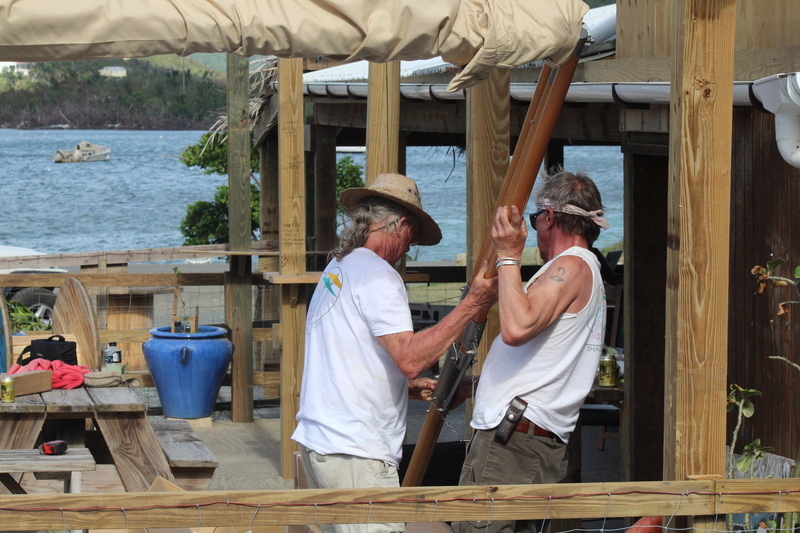 St. John Shade Project volunteers, Charlie and Don, work on getting the new pavilion shade up at Coral Bay’s Caribbean Oasis. The deck sports two levels, with a nice large seating area on the stage level, ready for live music coming back soon. Here, the St. John Shade Project installed the ShadeScapes Pavilion, a large, white shade canopy with a perfect fit across the upper deck. Two smaller, bright red table umbrellas, installed on the main portion of the deck, offer a wonderful splash of color and contrast nicely with the Pavilion and the other two large white umbrellas. When the power went out across the island–as one islander said, “Going to be happening a lot for a while”–everyone just kept on working. Just another bump on the way to recovery. There is still work to be done on St. John and everyone will be busy for a while. But no one is too busy to celebrate what they love most about the island: it’s a little slice of paradise with friendly people, good food, and great venues. Like Oasis, St. John and the U.S. Virgin Islands are open for business. The St. John Shade Project had fun bringing shade to this great spot, hearing Karen’s story, and meeting new friends. St. John Shade Project crew member Chris brings a new look to Oasis. Karen of Oasis tells her story of surviving Irma and Maria, as she and the St. John Shade Project team work to get things back on track.